The number 9 bus from Sembel to the bus station for the Dekemhare buses is chock-full even before it leaves the Sembel area. But by now I am used to this mode of transport and holding my hands tight on both sides of the entrance door, I use my belly to stimulate the people in front of me in the bus to move a little forward. At the next bus stop I am the one that is carefully pushed in the direction of the driver. And before we reach the Dekemhare bus station, I have managed to move to the front of the bus to get out easy. 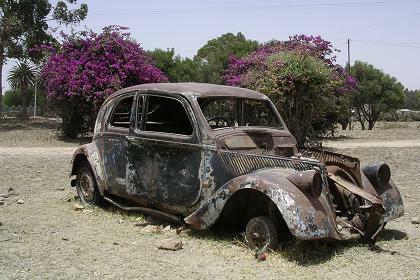 An old Mercedes Benz mini bus takes us to Dekemhare for 6.25 Nakfa. The last few kilometers to the orphanage I take a taxi for 20 Nakfa. I am still figuring out the economic rules that make the long distance buses this cheap. 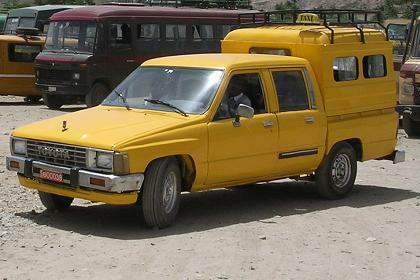 Although the buses are very old and uncomfortable, the price of one liter of fuel is 4.5 Nakfa only. At the orphanage I meet Tekie Goitom, the manager. I hand him the plastic bag with the last pencils and other small things, I collected to bring to Eritrea. Tekie will know what to do with them. I tell him Marijke Nijhuis will visit his orphanage a few days later. He knows. Marijke will bring a Toyota Van, completely refurbished, donated by the sponsors of Child Care Afrika and she will discuss the water project. The drilling for good drinking water was not successful. The water is good enough to irrigate the land, but it is to salt for human consumption. So they will start a project to collect water from the roofs when in rains, which means another large investment. But water means life. Not only for the orphans, but also for the beautiful Dutch cows and the many chicken that are kept on the orphanage compound. The children all help to take care of the animals and to grow their vegetables on the field flooded with the equipment provided with the money of Child Care Afrika. Tekie shows me the compound, the dormitories, the kitchen and the classrooms, all sober, but in a very good state of maintenance, thanks to the work of Marijke's organization. 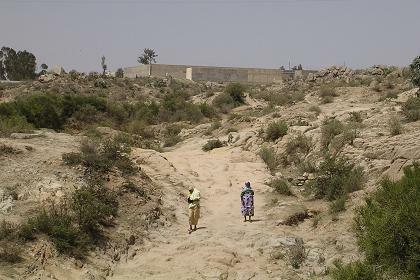 After my visit to the orphanage I start walking through the village and after some hours I walk back in the direction of the checkpoint to picture the huge stones just outside Dekemhare. When I pass the checkpoint for the third time today, the military want to register my passport. "Sorry, but it is procedures". The six visa are a good reason to tell them about my experiences in Eritrea. We chat until I see a bus that is coming down from the mountain. The bus is heading for Senafe and will not take any extra passengers for these three kilometers to Dekemhare. But it is getting hot, so I will wait under the shelter for the next bus. "Is there anything we can to to help you? ", one of the soldiers asks. "Wish me luck that the next bus will take me back to Dekemhare. It is to hot for long walks", I reply. The next bus has Dekemhare as its destination. And one of the other passengers offers me his seat. And he does not allow me to refuse it. In Dekemhare I wander through the opposite side of the village, buy some roasted maize cobs, mango juice, cold milk, and some fruits at the market. Taking pictures of the women roasting the maize cobs is not appreciated. An old women is addressing complaints in Tigrinya. I apologize and show her that I am deleting the picture. When I think I have seen it all, I walk back to the bus station, and when I pass the same checkpoint for the fourth time the military police greet me in a very friendly manner. Ninety minutes later I am back in Asmara. In Bar Selas I drink some beers. One of the men offers me another drink. I tell him that I am the rich tourist, so I should offer him a beer. "But I came up with the idea first", he says. We drink some beers and around 6:00 PM I have a pizza in Terhas' pizzeria. 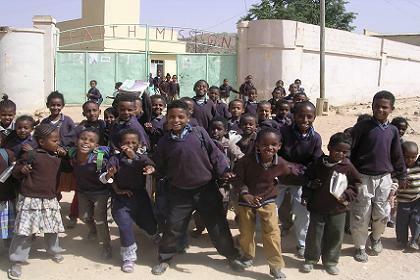 Children of the Faith Mission School and Orphanage - Dekemhare Eritrea. 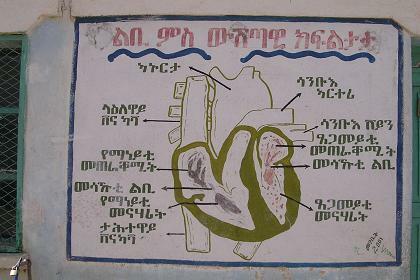 Decorations on the outside wall of the school - Dekemhare Eritrea. 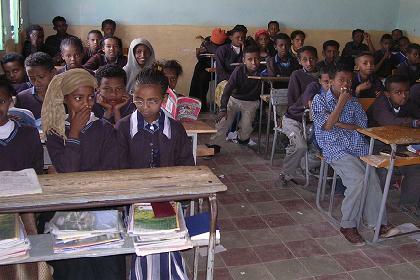 Classroom of the Faith Mission School - Dekemhare Eritrea. 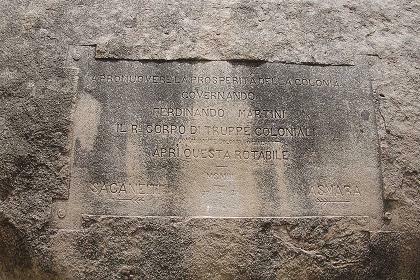 Remainders of Italian colonial history. 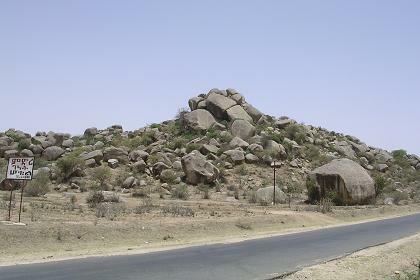 by Ferdinando Martini two kilometers outside Dekemhare. the prosperity of the Italian colony". 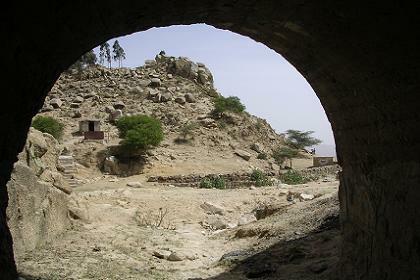 1911 - Dekemhare Eritrea. Local transport - Dekemhare Eritrea. 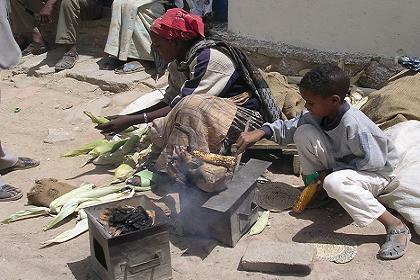 Roasting maize cobs - Dekemhare Eritrea.